The Kensington Lip Balm Tubes are a great addition to any promotional campaign - practical, full colour branding space - greta value-for-money. It's said that applying lip balm daily is important for overall lip health. The skin on your lips has no way to produce it's own oils to stay moisturised unlike other skin on the body. It also contains no melanin, which means no natural protection from the sun either! 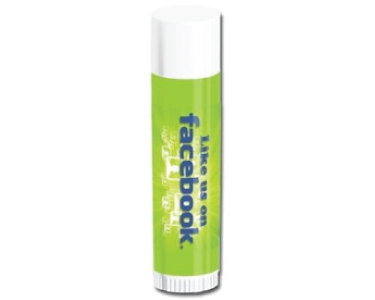 So Promotional Lip Balm is a fantastic way of promoting healthy lips and your company logo. No one wants to kiss dry chapped lips. But don't worry lip balms are a great way to get healthy kissable lips in a flash. These are especially important during those cold dry windy months and will be a lifesaver! Or during those sunny summer days where getting sun burnt is a real problem. Trust me lip balms are a lifesaver and not enough people use them! That's why they make for a fantastic giveaway item that everyone will appreciate. You'll find something that fits your needs in our gallery today. After the budget friendly option? Have a look at our "Printed Lip Balms" or maybe you're at the beach and need something with good sun protection? "SPF 30+ Lipbalm" are the smart choice! Or maybe you like the idea of the lip balms hanging on a lanyard, "Lanyard Lip Balms" are perfect for this. If you've got any questions about our selection or Promotional Lip Balm in general have a quick look at some of our frequently asked questions below. Don't see your question? Don't stress, simply send us an email today or call us at 1300 303 717 and one of our friendly staff will help you however we can. Q: Where can I buy giveaway promotional lip balms? A: All of our selection right here is fantastic. You'll find something that fits your next promotional event like a glove. Q: How does lip balm work? A: Lip balms apply a barrier to your lips that helps prevent them for drying out or getting burnt. They can also provide some moisture to help repair damaged lips. Q: How can I benefit from personalised Lip Balm? A: They're small, lightweight and have a low cost per unit that makes them a perfect giveaway item at your next promotional event. They are also under used and appreciated so you're sure to be helping someone that might not usually buy lip balms for themselves. Q: What decoration should I get on my Custom Lip Balms? A: Pad print is usually the best choice for most lip balms. It looks great and will allow your logo or message to be easily seen and remembered.